“...most of the memoirs and reports [of 'Holocaust survivors'] are full of preposterous verbosity, graphomanic exaggeration, dramatic effects, overestimated self-inflation, dilettante philosophizing, would-be lyricism, unchecked rumors, bias, partisan attacks...”—Samuel Gringauz, "Jewish Social Studies" (New York), January 1950, Vol. 12, p. 65. Hunt, Eric 'Holohoax Survivors Who Tell The Truth' has really hit a nerve. It's shocking to hear Auschwitz inmates tell about their elaborate stage, with curtain rings and a grand piano, where they had plays and other musical performances. It's shocking to see video of happy children playing in Theresenstadt juxtaposed with a woman telling about fun costumed children's plays in her Auschwitz block, along with arts and crafts activities, with beautiful children's murals painted on the walls. According to the official Holocaust narrative, all children were immediately gassed upon arrival! 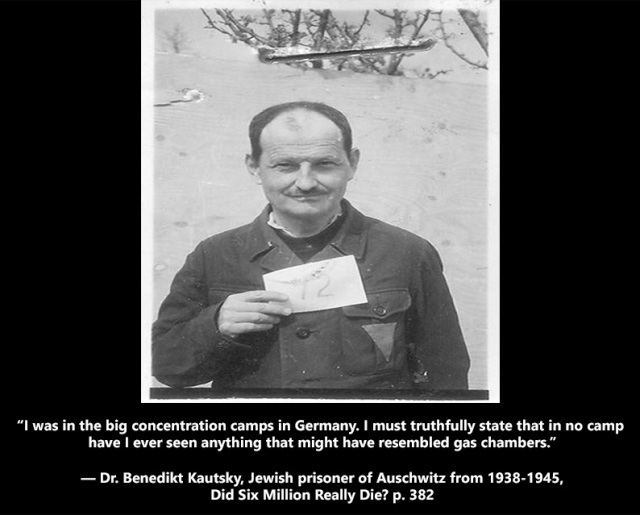 "Testimony" such as this is extremely important to cast doubt on the "factory of death" Holocaust promoters push. Auschwitz and Buchenwald inmates speak about being paid for their work in special currency, using their currency in camp cantinas and at the camp movie theater, receiving and sending postcards, and playing in well organized soccer tournaments. Elie Wiesel Cons the World When he injures his foot, instead of being sent to a gas chamber (or the burning pit) because he is no longer useful, he is put into a hospital where surgery is performed on his foot! Not only that, his father is allowed to stay there with him. Murder in Wiesenthal's Footsteps With horror we find that all twelve hunted "deniers of the gas chambers" died under mysterious circumstances. Interestingly, Uwe Barschel (the chief minister of Schleswig Holstein), Heribert Apfalter (the president of the nationalized Austrian steel industry), and Herbert Amry (the Austrian ambassador in Athens) also died the same mysterious way as did the "gas chamber deniers", as described here. Does the Mossad have a "Tesla Ray" weapon? For the Benefit of Judy Cohen An expose of Holocaust activist, Judy Cohen. How the British Obtained the Confessions of Rudolf Höss by Robert Faurisson His confessions were false. They had been extorted from Höss by torture, but it took until 1983 to learn the identity of the torturers and the nature of the tortures they inflicted upon him. Porter, Carlos W. "If you can't eat 'em, beat 'em (or, How I killed thousands with my bare hands)." 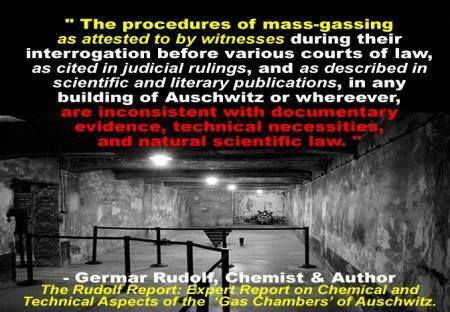 " Today, gas chamber witnesses are making themselves extremely scarce and the Demjanjuk trial in Israel, which once again has revealed how much false testimony is involved in the matter, has contributed to the suppression. Several years ago, it happened that I was aggressively questioned at the rear of a law court by elderly Jews who presented themselves as "living witnesses to the gas chambers of Auschwitz", showing me their tattoos. It was necessary for me only to ask them to look me in the eyes and to describe for me a gas chamber that inevitably they retorted: "How could I do this? If I had seen a gas chamber with my own eyes I would not be here today to speak with you; I myself would have been gassed also." " ----Faurisson.